The Easton Lions are gearing-up for their 33rd annual Charity Auction. This year we have received two unique and sought-after items. Both are on display in town. 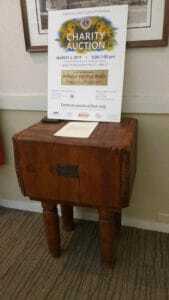 First, in the lobby of the North Easton Savings Bank’s Main Street branch, we have an antique butcher block donated by David Ames from the Governor Ames’ Estate. 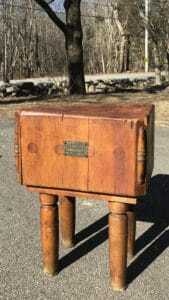 The butcher block, measuring 33”h. x 21”w. x 19d., was made in Boston, Massachusetts by the William G. Bell & Company. and includes a letter of authenticity from David Ames who donated it. 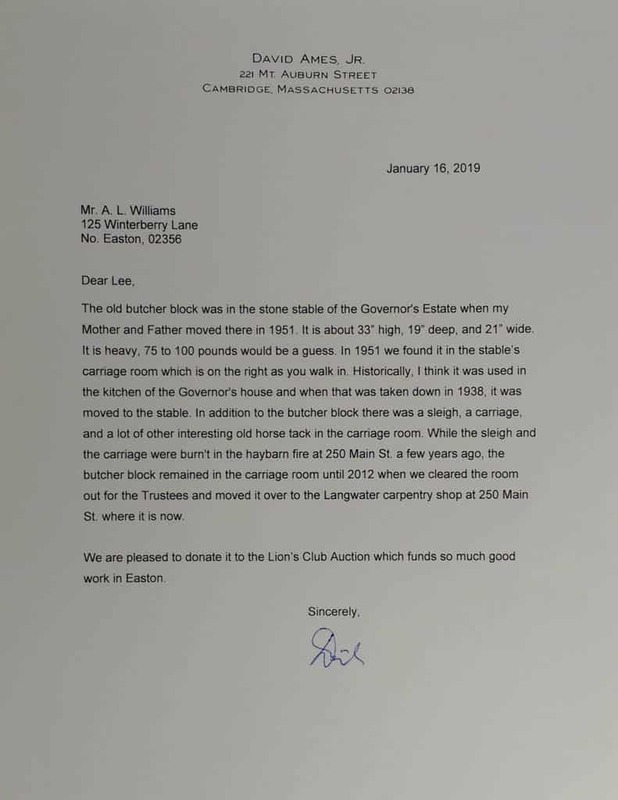 Mr. Ames says that “the old butcher block was in the stone stable of the Governor’s Estate… Historically, [he] thinks it was used in the kitchen of the Governor’s house and, when that was taken down in 1938, it was moved to the stable.” For additional information about the Butcher Block, contact Lion Lee Williams at 508-345-6544. 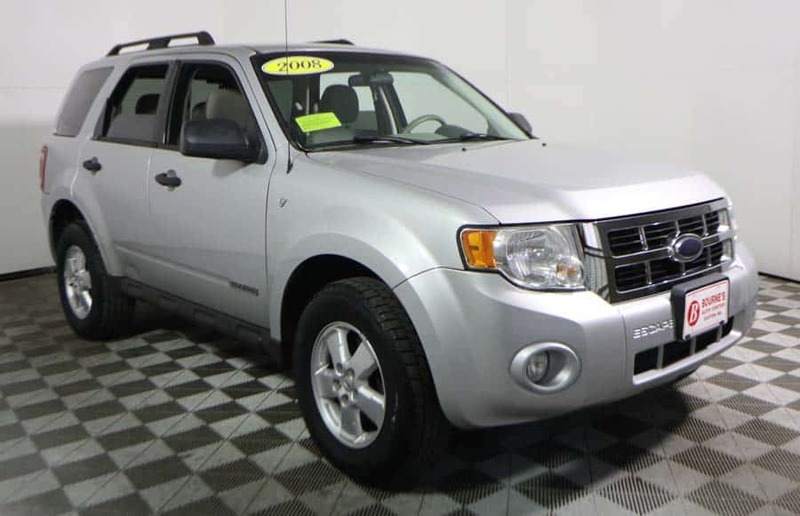 We also have a 2008 Ford Escape XLT donated by Bourne’s Auto Center. This white 4-wheel drive SUV is valued at $6,050 and includes Bourne’s 12 month/12,000 mile powertrain limited warranty. The car can be viewed at Bourne’s Belmont Street location in South Easton on Route 123 during regular business hours. To date we have received nearly 100 donations and are looking for more from the community. Some other unique items already on tap are a painting of a New England barn by a local artist, Alice Kent McCarthy with framing done by J. Inman Gallery & Frame Center, six cases of Boyajian oils, Dr. Halverson Easton Braces certificates, YMCA memberships, and many gift cards and certificates to local restaurants and shops from Easton and surrounding communities. Vistit our auction website, www.EastonLionsAuction.org for additional pictures of all items. Lion President Ram Penumarthy says “this is a wonderful community project that brings together many service groups and businesses throughout Easton. It’s a great way to get your products onto the local community tv.” This year we split the auction into two parts. The Online Auction goes from February 17th through March 1st. There will be nearly 100 items valued under $100 available for online bidding. 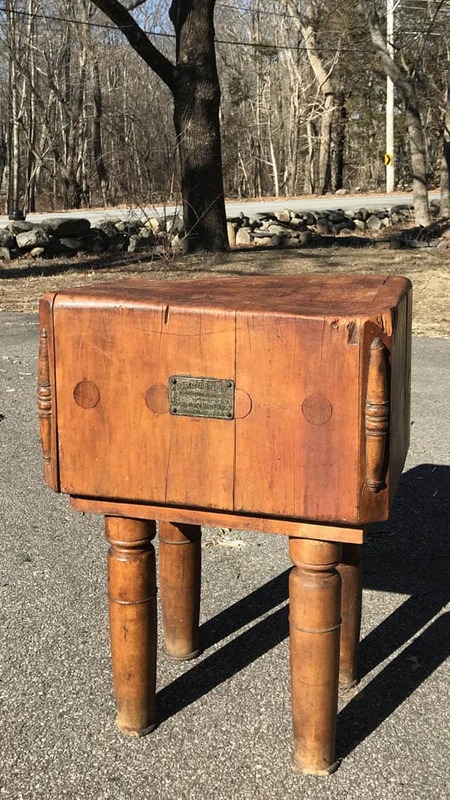 The live televised auction, with higher valued items, like the butcher block and car, is on March 3rd, from 2:00 pm to 7:00 pm. The Live auction will be broadcast by ECAT on local channels 9 and 22 from Stonehill College’s Pettit Atrium and simulcast online. All bidding for the live auction is done by phone by calling 508-230-7071. Money raised from both auctions goes towards local scholarships, community charitable organizations, and vision research. Dale Kerester, the Auction Chair says “The Auction is our second largest fund raiser, after the Easton Lions Thrift Store next to Buddy’s Villa on rt 138. 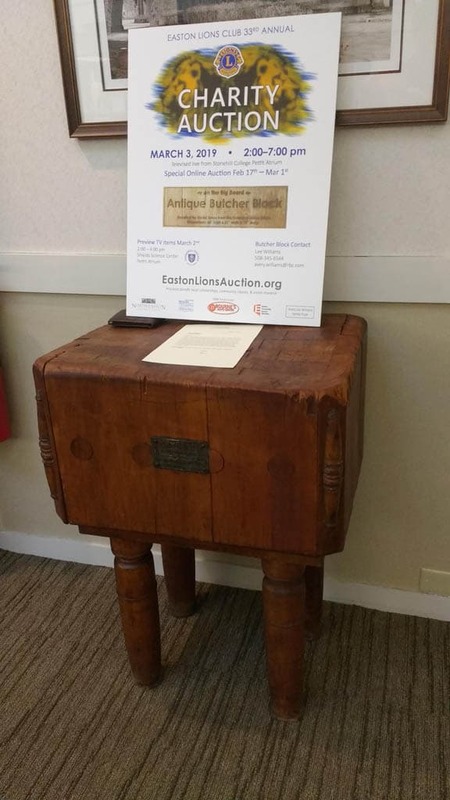 Last year we were able to give back over $15,000 to local community groups and projects.” If you would like to make a donation, go to www.EastonLionsAuction.org and download the donation form or contact Steve Hoffman via email at auction@eastonlions.org and a Lion will contact you. We’d like all donations in by February 17th, but will accept them through February 24th. Do you have what it takes to be a Lion? Our work is simple and rewarding: “Where there’s a need, there’s a Lion”. There are Lions Clubs in over 200 countries with 47,000 clubs and 1.4 million members helping others and making communities better. To find a club near you browse the Lions Clubs International site at www.LionsClubs.org – “Start Your Service”. The Easton Lions Club has 179 active members and hold dinner meetings on the 2nd and 4th Wednesday of the month at 7:00 pm at the Easton VFW on the Corner of Rockland St and Allen Rd. New members are always welcome. The Lions Club is a place where members give their valuable time and effort to improve the lives of our neighbors and children, and to build a strong community. Has anyone ever asked you to join the Easton Lions? Explore what it means to be a Lion on our website www.EastonLions.org, talk to a Lion, reach out to our Membership Chair, Rob Goodrich, at membership@eastonlions.org. or call Avery Lee Williams, our Chief Recruiter, at 508-345 6544. Rob and Avery would like to invite you to be our "no obligation" guest at an upcoming meeting to talk with our active members and learn who we are.